Nowadays, the season of fresh green, we climbed the Mt. Futatabi the mountain behind our house and had Chinese noodle, omelet and beer in the teahouse “To-ro chaya”. As we wrote before, there are nice local teahouses along the trail in the mountain around here where you can have tea, juice, beer and foods. These teahouses can be a good reason to climb who has not enough courage to climb to the top of it. 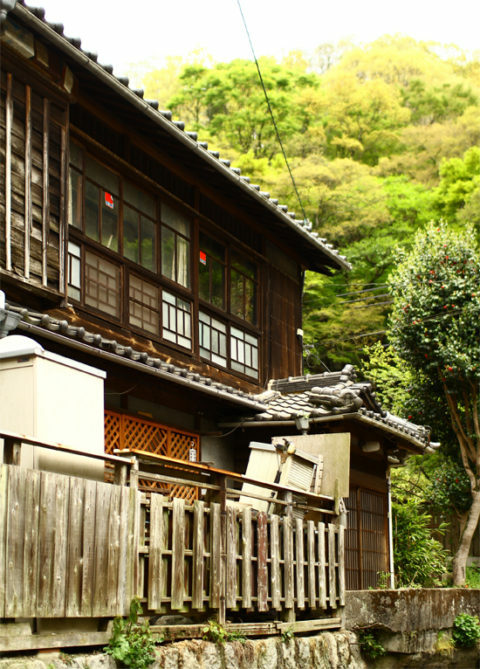 This house in the picture is a house along the trail to To-ro chaya. There was a TV advertisement which goes as “Are you securing your home with our system?”. The house is terrace house and there are other houses next to it with aluminum sash, but this one with wooden sash is really lovely. It is only 30 minutes to To-ro chaya from Motomachi station, it is just right there if you find this house. There is a cafe where you can have pizza, pasta and grilled dishes just behind To-ro chaya, we’ll visit there one day and will report to you soon!